Last Tuesday, we delivered a public letter to Immigration and Customs Enforcement (ICE) urging the immediate release of the over 100 asylum-seeking individuals who are detained at the Sheridan Federal Correctional Institution. And all last week, faith communities throughout the state flooded the voicemail of ICE's acting regional director, Elizabeth Godfrey, with our demand to “Let Our People Go!" But our people are still detained. So we're going back. We're going back to the ICE headquarters in Portland to demand once again the freedom of our people in Sheridan and in detention centers across the country. We won't let the Pharaohs of today rest until freedom is secured. And we're willing to put our bodies on the line. Join us. Bring your friends and community members. 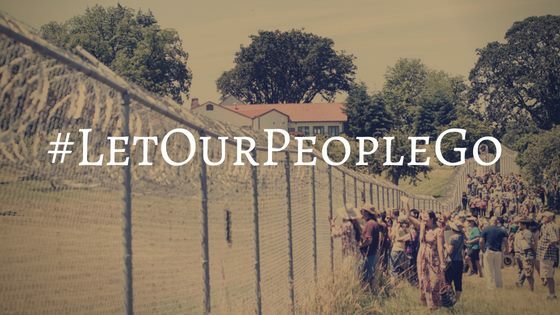 Bring your signs that say, #LetOurPeopleGo. If coming to Portland on Tuesday morning isn't possible for you, pick up the phone. Use the talking points in the link below and mobilize your community to phone bank, email, and flood acting regional director of ICE Elizabeth Godfrey and our congressional delegation with stories of those detained at Sheridan and our demand to “Let Our People Go!"